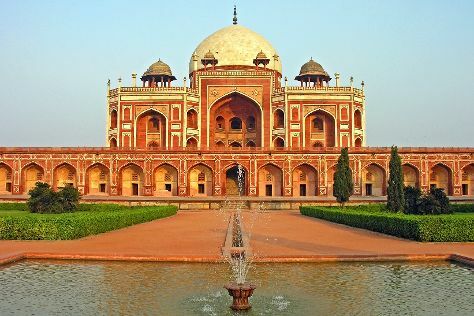 Start off your visit on the 18th (Sat): don't miss a visit to India Gate and then don't miss a visit to Humayun's Tomb. For photos, reviews, ratings, and other tourist information, you can read our New Delhi trip tool . Mumbai to New Delhi is an approximately 4.5-hour flight. You can also take a train; or drive. When traveling from Mumbai in May, plan for somewhat warmer days in New Delhi, with highs around 47°C, while nights are about the same with lows around 30°C. Wrap up your sightseeing on the 18th (Sat) to allow time to travel to Shimla. Start off your visit on the 19th (Sun): witness a stunning natural landmark at Hotel Hot Spring Therme & Spa, then take in the spiritual surroundings of Jakhu Temple, then don't miss a visit to The Mall, and finally admire the landmark architecture of Viceregal Lodge. For maps, traveler tips, ratings, and other tourist information, read our Shimla attractions planner . You can do a combination of flight and taxi from New Delhi to Shimla in 4.5 hours. Alternatively, you can drive; or do a combination of train and taxi. Wrap up your sightseeing on the 19th (Sun) early enough to travel back home.